For the past 3 years I’ve selected a word as a gentle reminder of what I want to invite into my life each year. This year my One Little Word is CHOOSE. 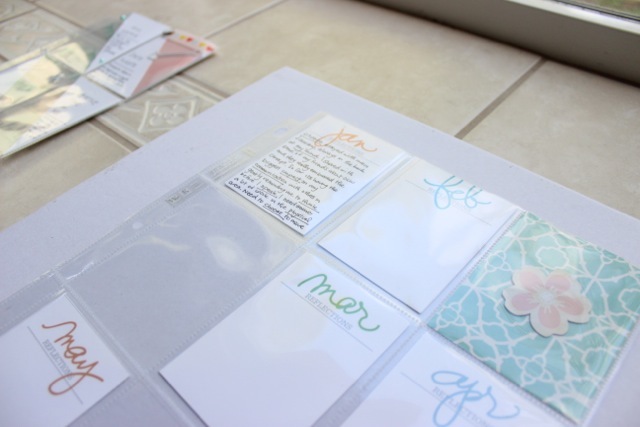 I’m participating in the One Little Word workshop with Ali Edwards and sharing my journey with CHOOSE each month here at Heartmix. To start off this month Ali introduced some monthly reflection cards that will help us look back over each month and allow us to give thought to how we tried to live out our intentions. I think this will be a good exercise to bring me back to why I chose my word and to help me identify what I might want to focus on for the following month. Reflecting back on these initials weeks of 2014 I’ve really been able to slow down and CHOOSE how I’m responding to others, especially Reza. Areas that I’d like to focus on in the coming weeks are CHOOSING to soften more with Reya. I pretty much need a constant reminder that even though she is a mature 6 year old she will still need my help A LOT of the time and that is OK. I also need to come up with a game plan to get moving physically. I recently read this post from zenhabits which really reiterates the idea that small incremental changes are what leads to larger changes in habits. So instead of setting a pie in the sky goal of heading to the gym 3x a week, I’d like to start just a small morning exercise routine. Maybe just 10 sit-ups each morning as a small change so that I can build myself up to a bigger plan. This month’s prompt was to decide on 6-12 actions to take over the course of the year that will help make real your intentions with your word. Since there would only be twelve cards Ali suggested cutting the last column of the page protector and I love ideas that add variety to an album. In the example, the action cards were numbered, but for my left-brain, numbers=order and then I would have to do these things in order and so I chose to leave mine numberless. 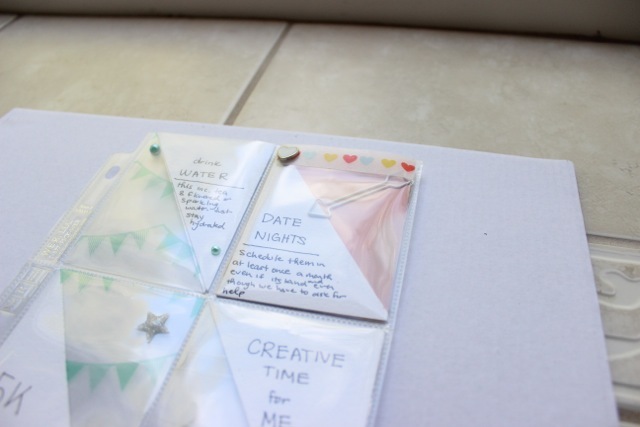 I have recently been inspired by the triangles Elise Blaha used for Project Life and how Jennifer Wilson used triangles on her One Little Word title page. So I decided to incorporate them here on my action cards. I would have liked to stitch along the seam where the two triangles meet but I’ll have to visit Ally first to get my hands on a sewing machine. You can see the bottom half of this image at the top of the post. My front page actions are: drink water, date nights, 5k run, creative time for me everyday (guilt-free and even if its only 15 min), and explore more of the South Bay (I love discovering cool little hangout places and there are lots of hiking trails and parks we’ve never visited). 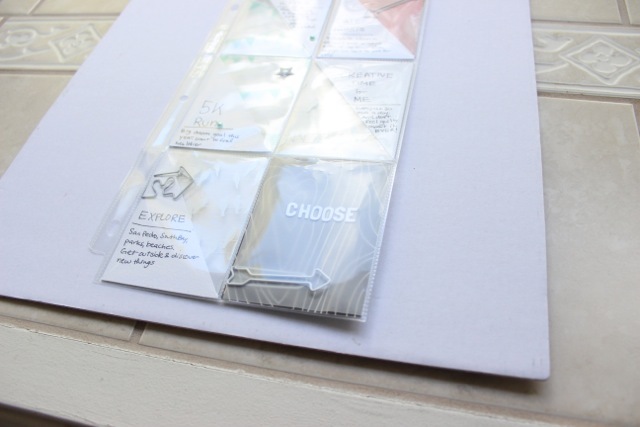 I used transparencies on 4 cards as I really like the clean airy look they add to pocket page albums, especially when when you’re already using a lot of white. 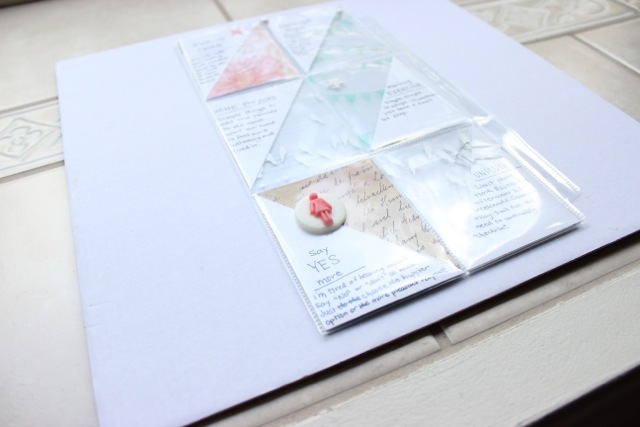 I didn’t want cards backing up to those so I just adhered a journaling triangle to each side of the transparency so that it would remain clear. All of the embellishments are from Freckled Fawn’s February ohdeerme kit. I’m not a subscriber but I was really drawn to this months kit so I made a “one-time” purchase. I really love it though so we’ll see what they have in store for March and I may be a subscriber the next time you hear from me. I’m such a sucker for Happy Mail. 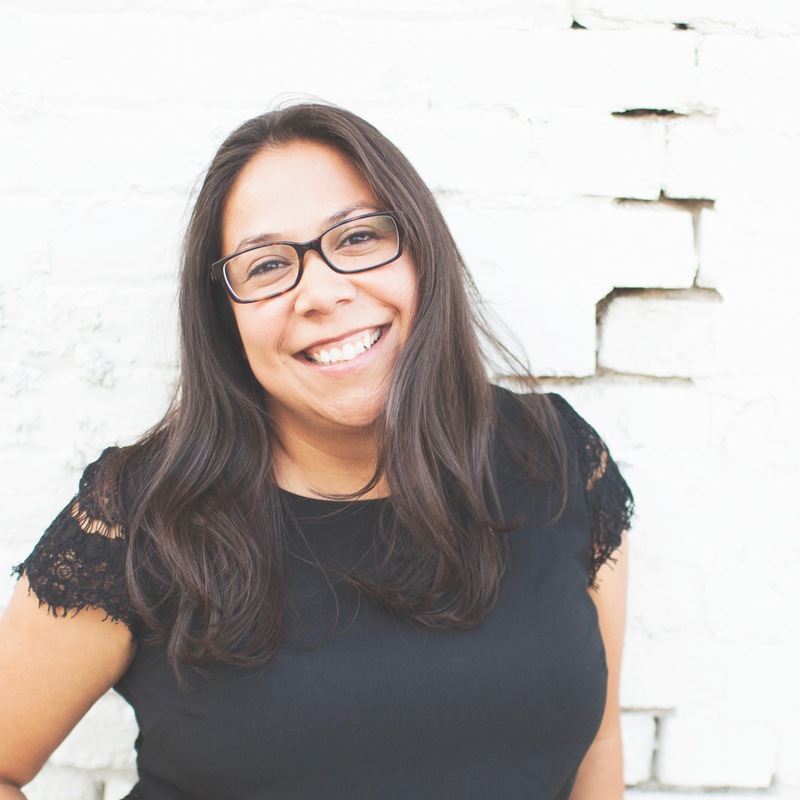 My back page actions include: pick up the phone (call instead of text), morning & night routines, home projects (just simple things that will make our home of 4years! feel more lived in and welcoming), morning exercise, say yes more, and unplug from social media (less “checking-in”). Thanks for taking a peek at my February layout. Did you chose a One Little Word this year? How has it worked in your life recently? Let us know in the comments. Thanks for checking it out Tina! I noticed you have Australian Cattle Dogs. My Dad loves them. He’s raised 5. They’re very energetic happy dogs!